JA Voice is a commercial extension. Get Your License NOW! Please note that JA Voice does not require ioncube loader any more. module - the modules used by the component. - Quickstart : applicable for Web Browser Installation (recommended if you are new to Joomla!). This is actually a Joomla! package with JA Voice built in already together with demo content. - component : applicable for Manual Installation. In this folder you will find com_javoice installation file. - modules : applicable for Manual Installation. You already have a Joomla! 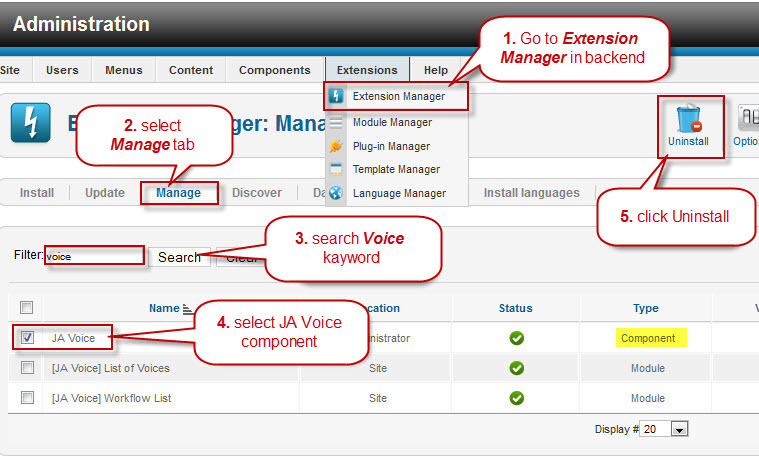 site, simply install these packages to integrate JA Voice modules to your current site. At the moment, JA Voice comes with two core modules mod_javlatest_voices and mod_javwork_flow. Detailed guideline for installation are mentioned in section Installation below. Install ionCube Loader JA Voice distribution is partially encrypted, thus a ionCube Loader is required to read encrypted files. If ionCube Loader is not yet available on your server, you have to install and configure ionCube Loader first. Extract ionCube files to ioncube folder under your webroot folder. From web browser, load path to file ioncube-loader-helper.php of the newly added ioncube. Add lib file path to php.ini as specified on ioncube-loader-helper.php. Restart your server and refresh ioncube-loader-helper.php to make sure ionCube loader is loaded correctly. Note: ioncube is not compatible with PHP 5.3.0 servers. Step 1: Unzip and upload the Quickstart package (folder Quickstart mentioned in section Select Installation Package) to your WEB root folder, on your local machine or a remote host. Step 2: Assuming that you are working on localhost, rename quickstart pack to be javoice-j25. Then you start your Web browser and enter the URL http://localhost/javoice-j25. All you have to do now is to follow step-by-step installation of default Joomla!. the end of the address for example http://localhost/joomla/javoice-j25 or http://www.yourdomain.com/javoice-j25. With this installation option, you manually install core component and module add-ons, demo database is not included. In this step we will install the core component com_javoice and the two modules mod_javlatest_voices and mod_javwork_flow (Install the zip package via Joomla Installer, the component and modules are installed together). When you browse the first time the back-end of the JA Voice component, it will require a license key to activate the component. From the back-end of your Joomla! site (administration) select Menus-> Main menu. 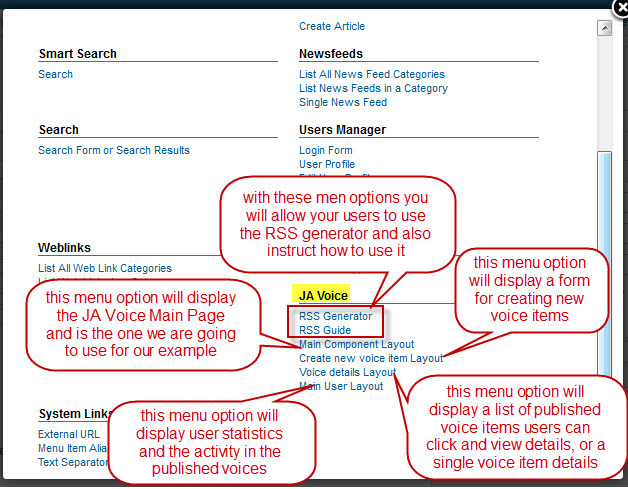 Click the New button and JA User Voice component (as shown in screenshot), then follow Joomla! default instructions. From the back-end of your Joomla! website (administration) select Extensions-> Module Manager. Now, JA Voice component and modules are ready to go! Now JoomlArt provides a better way to upgrade all your Joomla! Extensions! 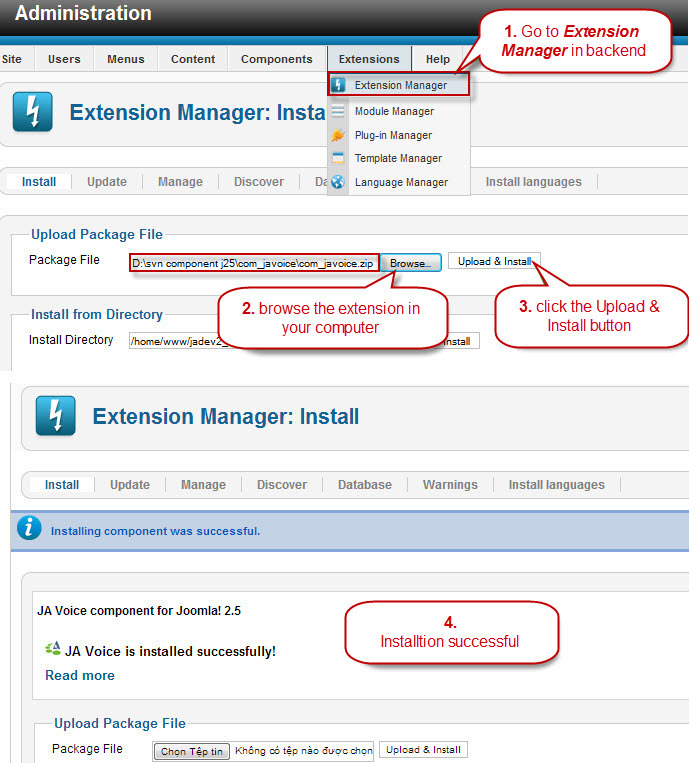 To upgrade each of the extensions used by JA Voice, you can use the new JA Extensions Manager so please follow the instructions described in this documentation section. Please remember to back-up your language files. 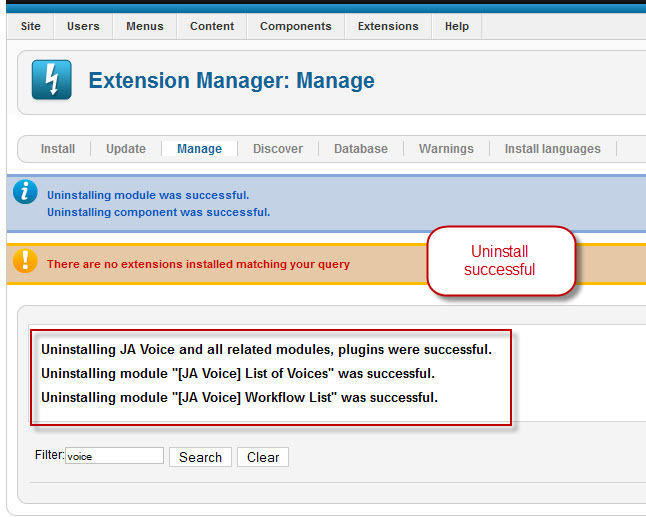 JA Voice Component Upgrade process using JA Extensions Manager does not require any code alterations. This means that the installation packages are prepared by the development team for you, so you don't need to follow these steps here but only for third party extensions or very old JA Voice. Please refer to this documentation section on how to upgrade the Joomla! Extensions using JA Extensions Manager, but keep in mind the classic upgrade steps below as they might help you find out why something went wrong on upgrade process. Click here to see video below to see JA Extensions Manager in action! Before you proceed with the JA Voice Component upgrade, please perform a full back-up of your website. The upgrade process consists in uninstalling the old versions of core component and modules, and installing the new/updated versions. JA Voice Component stores the configuration in it's database, and the database is not deleted on unistall. For any of your frontend customizations you have to note them in text files to easily apply again after upgrade. The stylesheets can also suffer modifications, so you should track CSS code changes also. Please refer to the Installation chapter on how to install Joomla! Extensions. After you finish with the upgrade process, you can proceed applying the frontend customizations. Supposing you have customized your frontend view of the component and modules, you can easily update your code using WinMerge or any other file/folder compare solution. If you have questions, or you have found find any issue using the JA Voice component or modules, please refer to the JA Voice section of the JA Forums.